If you guessed that these performances were presented for the benefit of three young and very talented contest winners, you’d be right. Each of these prize-winning soloists at the ARD International Music Competition in Munich was given the opportunity to launch his or her career in a concert appearance with the Bavarian Radio Symphony Orchestra. The CD at hand documents those concerts. 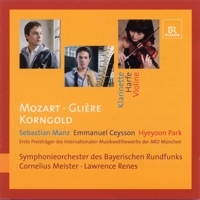 For his solo appearance Sebastian Manz chose perhaps not the most difficult clarinet concerto in the literature, but certainly the most widely known and loved, Mozart’s A-Major Concerto, K 622. Playing a basset clarinet, and properly so, Manz navigates his part with exceptional agility, gorgeous tone, exquisite phrasing, and highly cultivated musical taste, quite an accomplishment for a 22-year-old. The influence of his teacher, celebrated clarinetist Sabine Meyer, is manifest. The double-action pedal harp was patented by Sebastien Érard in 1801. Its modern descendant has 46 or 47 strings and weighs around 80 pounds. Suddenly, one doesn’t feel so sorry for double-bass players anymore. This was the instrument that Reinhold Glière was writing for when he wrote his Harp Concerto in 1938, and in doing so he sought the help of harpist Ksenia Erdeli. In fact, so extensive was her advice that Glière proposed to credit her as co-composer, but she refused the honor, preferring to be acknowledged as the editor. The result was a piece as idiomatically written for the harp as any ever has been; though judging by the number of currently listed recordings, it doesn’t seem to be quite as popular as I believe it once was. Emmanuel Ceysson is really superb. He plays with fluent ease in the most difficult passages and spins the score’s enchanting Russian lyricism with color and character. Seventeen-year-old Korean violinist Hyeyoon Park is obviously very talented. She would have to be to tackle Korngold’s technically taxing Violin Concerto. The difficulty she faces is that there have been at least three quite recent recordings of the piece, by Renaud Capuçon, Vadim Gluzman, and Nikolai Znaider, on top of which there are classic versions by Heifetz and Perlman, as well as fine accounts by Mutter, Hahn, and Ehnes. Park is very good, but she is not yet in the same class as those named, though she comes pretty darn close, which is an amazing achievement for one so young. She plays with solid technique, tonal vibrancy, and strong emotional commitment. It wouldn’t be fair really to compare any of these three soloists to much older and more seasoned artists who have performed these concertos many times in concert under various conductors and with different orchestras. These are firsts for all three of them, and exceptional firsts they are. This is a beautiful recording—most enjoyable and highly recommended.